Do you feel like your character is yelling at everyone? This mod fixes that problem by adjusting the player character voice volume level. Several volume levels to choose from. It always seemed to me that the voice volume for the player character is too loud compared to others. It felt like I was yelling at everyone. 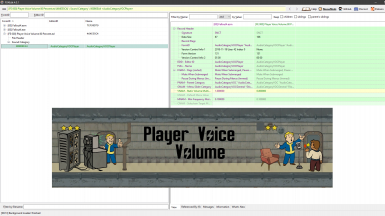 This mod fixes that problem by adjusting the player character voice volume level. The other mods that I found either muted the voice completely or cut it to 50 percent (now updated with Lots of Volume Options! See Attention Note below. ), which I found too quiet and was hard to hear over some background noise. I prefer 80 percent, but I have provided several volume levels from 55 to 95 percent, as well as a muted ESL file, so everyone can find their personal preference. I have provided all as "Full" or "True" ESLs and will load near the top of your load order. I will not be providing any other options. This is a very light mod that only adjusts one variable. It shouldn't conflict with any other mods except those that touch the player voice volume. Only install one file. Easily installs/uninstalls via Vortex, etc. or simply copy/delete in your Data folder. THIS MOD'S ESL FILE LOADS NEAR THE TOP OF THE LOAD ORDER.